Paulista Avenue could easily be the heart of SÃ£o Paulo, the biggest city of Brazil. It's the street where you'll find the headquarters of some of Brazil's - and the world's - biggest corporations. For a recent arrival, it's a curious scene. Take the subway and leave at the Trianon-Masp station. If you take a look around, you should spot the small police outpost nearby and, with a little more searching, the Paulista Center Mall. There you'll find that pretty much every single store is devoted entirely to selling pirated merchandise, mainly bootleg software and games. It's a pirated goods heaven, and it shows just how permissible piracy has become in Brazilian society. Although data isn't easy to come by, the Brazilian Association for the Development of Electronic Games (Abragames) estimated in 2004 that no less than 94 percent of the country's games market consisted of pirated merchandise. Similarly, Brazilian internet portal UOL reported in 2006 that the so called 'grey market' of illegally imported products made up 80 percent of Brazil's games market and 94 percent of its console market. 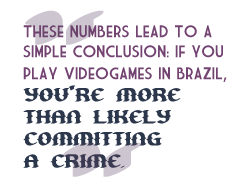 These numbers lead to a simple conclusion: If you play videogames in Brazil, you're more than likely committing a crime. So what's the experience of buying a pirated game in Brazil? To answer this question, let's take a trip to Santa Ifigenia Street, near the old business center of SÃ£o Paulo. Starting from the nearby church of SÃ£o Bento and continuing as you walk down the street, you're surrounded by a ridiculous farce. A dozen vendors fill the street, displaying small posters with crude photocopies of game covers and incessantly asking passersby if they're looking for PC or PlayStation 2 games. The farce comes into play every time a police patrol, the only cars allowed on this portion of the road, drives past. You won't necessarily hear a shout, but before the police arrive, every vendor rushes to pack up his product and head off to other parts, returning quickly after the danger has passed. This ritual repeats itself almost every day, without any noticeable difference. It's clear enough on Santa Ifigenia street that vendors are engaging in illegal activities, but take a detour to a nearby mini-mall and the signs of game piracy and legitimate commerce blend together. Stores here won't sell the blatant pirated games you can find on Santa Ifigenia, but it's not hard to figure out that at least some of these games are 'grey market' imports, not the least by the fact that these stores are often unwilling to give out an official receipt after a purchase. However, if you're really interested in buying a game, your best bet is to enter one of the many "pseudo-malls" around SÃ£o Paulo and take a look at what the games stores offer there. These shops, the vast majority of which consist of little more than a tiny cubicle with a store counter, don't display pirated games directly. Instead, they offer customers a cheap pocket binder containing the same crude photocopies the street vendors use or, occasionally, just a list of games.